The origin and history of Beef Stroganoff is an excellent lesson in food lore. While food historians generally agree the dish takes its name from Count Stroganoff, a 19th century Russian noble, there are conflicting theories regarding the genesis of this "classic" dish. Certainly, there is evidence confirming the recipe predate the good Count and his esteemed chef. Despite the allusion of the name "stroganoff" to Count Paul Stroganoff, a 19th century Russian diplomat, the origins of the dish have never been confirmed. Larousse Gastronomique notes that similar dishes were known since the 18th century but insists the dish by this specific name was the creation of chef Charles Briere who was working in St. Petersburg when he submitted the recipe to L 'Art Culinaire in 1891, but the dish seems much older. It did not appear in English cookbooks until 1932, and it was not until the 1940s that beef stroganoff became popular for elegant dinner parties in America. Restaurant Hospitality, John Mariani, January 1999 (p. 76). Unlike the French, who name dishes after the chefs who devised them, the Russians have usually attached the names of famous households to their cuisine--the cooks were usually serfs. For example, we have Beef Stroganoff, Veal Orlov, and Bagration Soup. One of the few exceptions is a cutlet of poultry of real named after Pozharskii, a famous tavern keeper...The last prominent scion of the dynasty, Count Pavel Stroganoff, was a celebrity in turn of the century St. Petersburg, a dignitary at the court of Alexander III, a member of the Imperial Academy of Arts, and a gourmet. It is doubtful that Beef Stroganoff was his or his chef's invention since the recipe was included in the 1871 edition of the Molokhovets cookbook...which predates his fame as a gourmet. Not a new recipe, by the way, but a refined version of an even older Russian recipe, it had probably been in the family for some years and became well known through Pavel Stroganoff's love of entertaining." Count Pavel Stroganov, a celebrity in turn of the century St. Petersburg, was a noted gourmet as well as a friend of Alexander III. He is frequently credited with creating Beef Stroganoff or having a chef who did so, but in fact a recipe by that name appears in a cookbook published in 1871, well ahead of the heyday of the genial count. In all probability the dish had been in the family for some years and came to more general notice throughout Pavel's love of entertaining. In a large skillet, heat olive oil over medium heat. Brown beef, breaking beef up as it cooks. Season meat with Worcestershire sauce, garlic powder, salt and pepper. Add onion and mushrooms, cook until onions tender. Add mushroom soup. Cover and cook over low heat for 15 minutes. Adjust seasoning if desired. Serve over cooked noodles. Enjoy! I like the way you present the history behind the Beef Strogonoff. It's very interesting reading. This really is an easy version of it, one of my favorite beef dishes from a long time ago, and you did a great job of it...Yumm! Hi Christine; I won't lie, I don't eat beef so I probably will never try this recipe ... but that does not mean that I did not thoroughly enjoy reading your post - always interesting to know the origins of things and it looks like you've done quite a bit of homework here! Great Job! Thank you, Chris's Gourmet Fashion. It means a lot to me. Christine, what a great post filled with well researched food history! A real joy to read and I haven't made beef strogonoff in forever but now your post has me wanting to make it again soon! Yum. Sounds like a simple and delicious recipe. I have been looking for a good stroganoff recipe. Thank you. it looks so good !! yami ! Great history! And a no fuss version is terrific! Great info here. 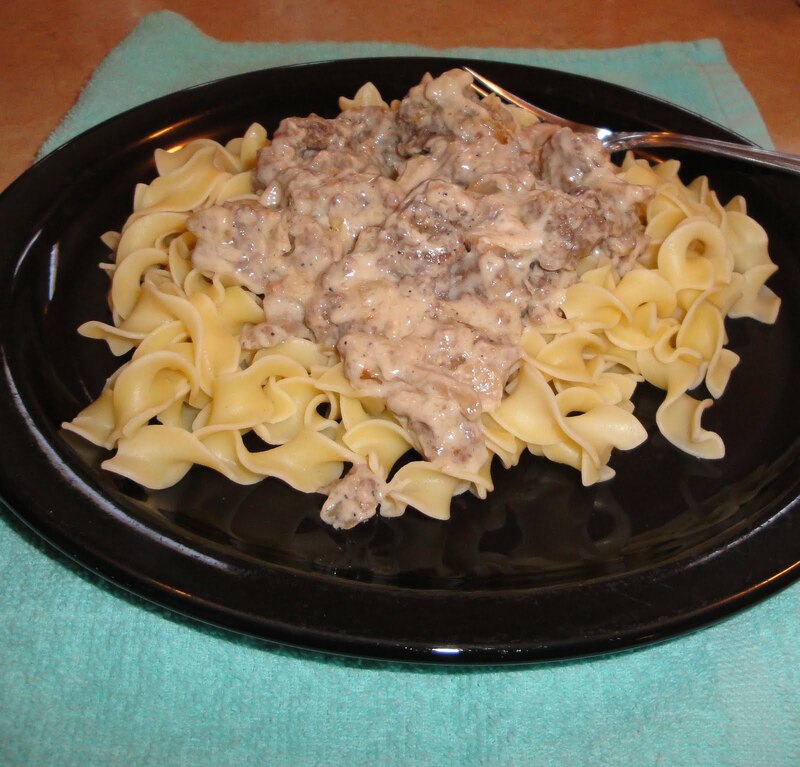 I love beef stroganoff...it is such comfort food and really hits the spot when you're craving it. Yum! Who knew that stroganof had such a history! Your recipe sounds very similar to mine....it's a staple in our house. It's one of the few meals that everyone loves. Hi Christine-Just popped back in to let you know how much I appreciate that beautiful little Vented Multi-Pot. So versatile, and so well made...a genius idea, and creation! I did see your post today. Great post! Thanks for meantioning me. I appreciate it very much. Enjoy!